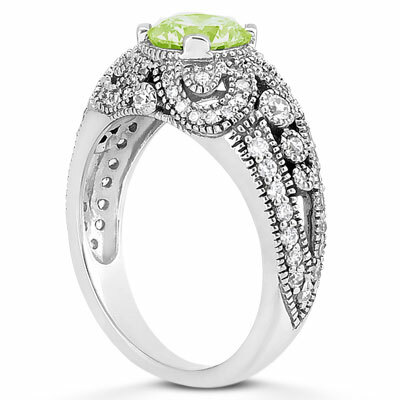 This design of this vintage style peridot and diamond ring in 14K white gold may be inspired by a bygone era, but the vibrantly-colored gemstone that adorns it gives this piece an eye-catching look that's perfect for the present day. A bright, sparkling round peridot, 5mm across, is the star of this ring, and it's partnered by over 60 accent diamonds that stud the meticulously-crafted 14K white gold band, as well as by elegant beaded edges that add both texture and class. 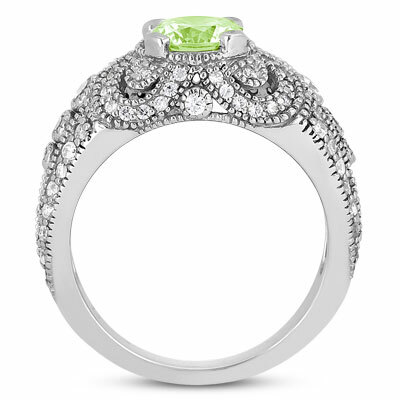 A bright apple green peridot is surrounded by 64 accent diamond in the vintage 14K white gold setting. 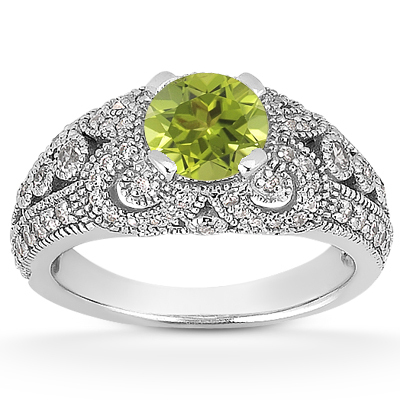 We guarantee our Vintage Style Peridot and Diamond Ring, 14K White Gold to be high quality, authentic jewelry, as described above.